Awhile back I wrote a blog post vowing to never write about Lance Armstrong ever again. I feel like Taylor Swift because I need to go back there again, despite saying never ever ever again. I don’t know how to avoid him as a topic after the two night confession extravaganza interview with Oprah Winfrey on the OWN network. I don’t know how anyone that follows professional cycling or is part of the cycling subculture would not watch. I wanted to ignore it, but I knew that I would watch. I did DVR the program both nights in the vague hope that I wouldn’t contribute to the ratings. I also didn’t want to contribute to lining Lance Armstrong’s pockets with much needed cash, but I am sure that Oprah paid him for the interview. There is no confirmation of that, it is just my suspicion of why he chose Oprah to conduct the interview. There were no real revelations to be had in two and a half hours of viewing. Oprah asked the most important questions first. Did you cheat? Did you use performance enhancing drugs? Did you lie about it? Armstrong answered yes to all three questions. I don’t think there are many people left in the world that would have thought otherwise before hearing it from Armstrong. What I had hoped to hear was that he was going to work with cycling’s governing body (UCI) or the United States Anti-Doping Agency (USADA) to show how he managed to dope for so long. I had hoped to hear some type of acknowledgment of wrongdoing, or even some remorse for what he had done to fellow riders, their families, the sport, or Greg LeMond. I didn’t feel like Armstrong took any of that seriously. The most repeated sound-bite of part one was his quote that he didn’t call Betsy Andreu fat. I did a quick poll on Facebook and Twitter before the interview to see if there was anything Armstrong could have said to change people’s opinions of him. Everyone claimed that their opinions were formed and it would be almost impossible to change them. Supporters still supported him and would no matter what, often citing his charity as a saving grace. Critics were expecting confirmation of doping and felt the damage done to cycling as a sport and to people around him were too much to forgive. I don’t think anyone expected Armstrong to barely say sorry before claiming that to him, doping was as necessary as “putting air in the tires”. He managed to come off as a big jerk. He never spoke about the cost to his family until the second night of the interview, though part of that might have been due to the OWN producer’s editing. There were many twitter comments and a few articles about his missed opportunity to help his image. I can’t disagree with the missed chances, but I also wonder how much of this is Armstrong’s own mentality, and how much is he reflecting society’s morays? I came across this article and advertisement in Bicycling Magazine the day after I watched Lance Armstrong sound so tone deaf on doping. Ted King’s article focuses on his belief that cycling’s attitude about doping is changing for the better. King speaks about a sea change at the rider level, each choosing to ride clean for themselves. I truly hope his is right, but the interesting thing is the advertisement that is positioned on the bottom half of the second page (Bicycling Magazine, January-February 2013, page 42-43). It is for MRI’s new supplement E02, a product that “…gives cyclists a proactive approach to building and maintaining endurance and oxygen availability to help power your body’s capacity to peak performance”. I did a quick Google search and came up with a site that quotes a marketing blurb not used in Bicycling. RBC seems like it should stand for Red Blood Cells from context, though it isn’t spelled out in the marketing blurb. A quick tour of MRI’s site also shows the claim that the product promotes “optimal circulation and oxygen utilization”. That sounds very familiar. It sounds a lot like the first sentence in the Wikipedia entry for Blood Doping. I don’t want to make too much over the placement of this particular advertisement in Bicycling Magazine. I can only assume that the product is safe to use as a supplement to a training regimen. I am sure that it is perfectly legal and not on any banned substance list. 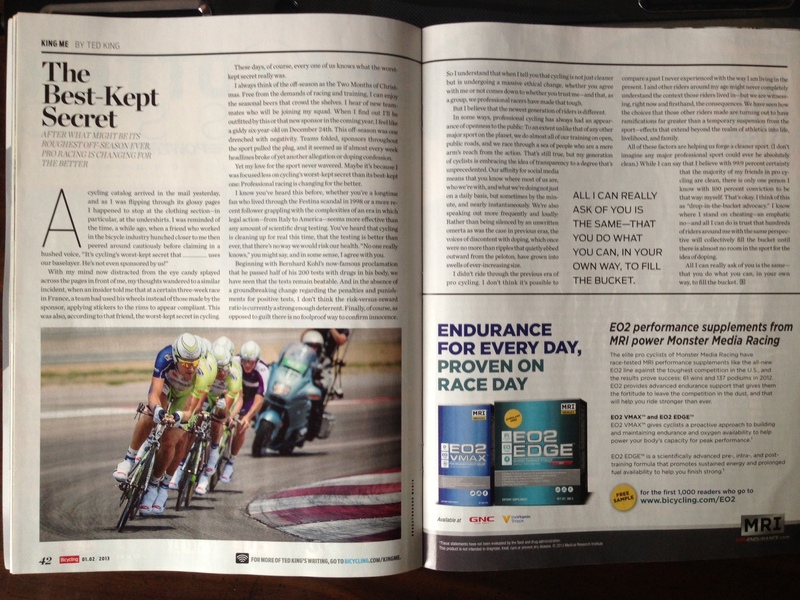 I also do not want to say that Bicycling Magazine should turn down supplement advertising, or any legitimate advertising. I will question the placement of the ad. I will also say that I wouldn’t have paid any attention to the product if it the advertisement was placed anywhere else in the magazine this month. What made it eye-catching to me is that it is a half-page advertisement for a supplement that mimics the effects of the very doping that Ted King is renouncing. I am not sure if that says more about the magazine editor’s poor choice of layout, or of the cycling community that might not see the placement as an issue, or even as ironic. Maybe this is part of the reason Lance Armstrong has issues seeing what he did as wrong. In his mind everyone is on something, their drug of choice just isn’t on the list of banned substances yet. I think that if cycling is to move forward, that is the mindset that needs changing on all levels, from disgraced pro riders to recreational riders like myself. We need to think that the rider that just dropped me is a better rider, not that they have better supplements. The last paragraph sums it up perfectly.